I was going throught my box of cards and found that many of them, which I made when I first started, are just not of my linking anymore. Knowing me, those cards will never get sent and will sit in there forever. It broke my heart to think that the paper I used in them would pretty much go to waste. Estaba revisando mi caja de tarjetas ay me di cuenta que muchas de ellas, las que hice cuando empecé, ya no me gustan para nada. Conociendome, esas tarjetas no iban nunca a ser regaladas, si no a vivir para siempre ahí. Me dio pena pensar que el papel usado en ellas sería básicamente un desperdicio. As I sorted the bad ones and tried to decide what to do with them, it hit my like a rock: I just had to "pimp" them!. Don't get me wrong, I am completely against redoing scrapbook pages as they are a reflection of me at the time I made them, but cards are a whole different story, if they are going to be hand out they better be cute! Mientras las sorteaba y decidia que hacer con la tarjetas feas, se me prendió el bombillo: sólo tenía que "enchularlas". No me malinterpreten, estoy totalmente en contra de rehacer páginas de scrapbook, ya que son un reflejo de mi en ese momento, pero las tarjetas son una historia diferente. Si quiero regalarlas mejor que sean bonitas! Much better looking indeed, with very little effort and a minimun use of new resources (only scraps, yay!). The combination of baby cards and scallops is oh-so-right. I also turned the center into a window (thank God for the Coluzzle) and decorated the onesie. Seems like this one will find its way into an envelope. Ahora tiene mucho mejor aspecto, con muy poco esfuerzo y con un uso mínimo de nuevos recursos (sólo los pedacitos de otros proyectos). La Combinación de tarjetas de bebé y festones queda muy bien y me ocupé de hacer el centro una ventana (gracias a Dios por el Coluzzle). Igualmente decoré el monito. Parece que ésta si encontrará el camino hacia un sobre. What a difference between these two and with so little changes! I have noticed, that when I make a card without knowing to whoom, it is quite difficult to use, only in a big hurry I pick up one of those. 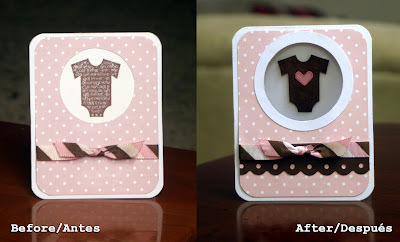 I should begin to make a baby-card soon, but I don't know yet, if it's a boy or a girl. I love the idea, Alina! I've been thinking of doing something similar. I have some cards that I made 10 years ago...they are UGLY! We didn't have the embellishments we have now. I love how you improved the card. I look forward to seeing more "time to pimp my card" features. Te quedó hermosa. A la verdad es que el cambio como bien dices no fue complicado pero la tarjeta es una hermosura. Eres el primer blog dominicano que visito y me encanta!! Saldudos desde PR.